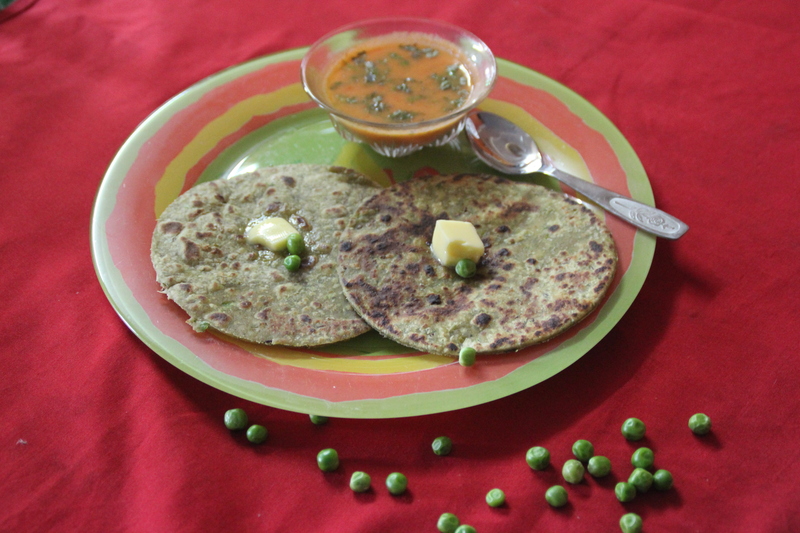 Mattar (Green Peas) is one of the vegetables which most people don’t love to eat. It is always a task at hand to make them have sabzi or gravy made from it. I personally don’t like them too. You can always find a pile of peas in my dish at the end of supper 😉 My mother in law found out a very simple and not easily detectable way to eat matter; Mattar Paranthe. Green Chili – 5 nos. Boil Mattar in a bowl with little water for around 10 mins. Take care it should not get overcooked. Take the boiled matter, green chili and ginger into a mixer and grind them into a fine paste. Now take this paste into a wide mixing bowl and add both wheat and soy flour to it. Now add all the species as mentioned above in the ingredients list. Mix everything with your hand to form dough. If you think the matter paste is not enough to bind the flour into dough, then you can add little by little more water till you knead it into fine dough. Make sure the dough is not too hard or too soft. Heat a non stick tawa. Make small equal sized balls out of the dough and roll each ball into a thick/thin roti (as per your preference). Carefully transfer the parantha on the tawa and cook for few seconds. Apply little ghee/oil and flip the parantha. Apply ghee/oil on the other side too and cook, turning sides, till both sides are equally golden. Transfer onto a serving plate and serve. 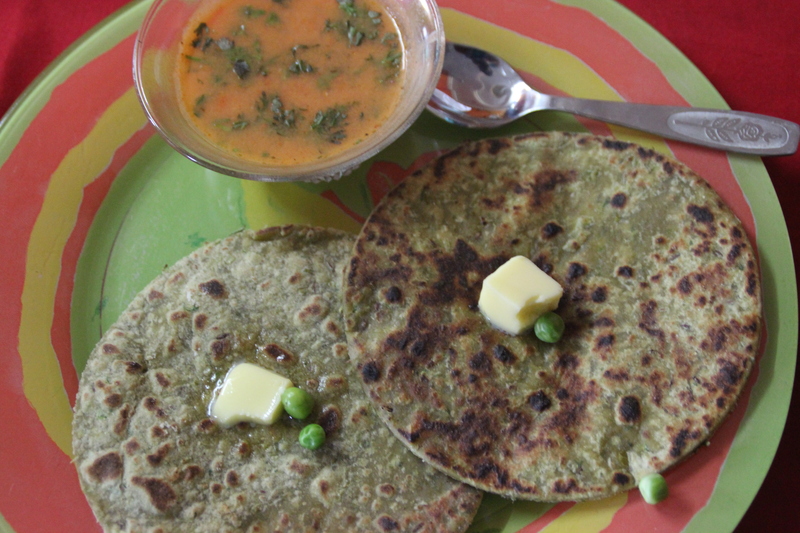 You can serve matter parantha with plain curd, raita or makhan. I served it with tamatar shorba in breakfast to my husband. He loved the combination. I have already shared its recipe before on our blog. Click to see the recipe of Tamatar Shorba. Knead the soft and smooth dough with enough water. Keep it aside for fifteen minutes. Divide the dough into six equal proportions. Take a bowl. Add boiled potatoes, cauliflower and raddish. Mix them well. Add chopped onion, green chilli and ginger paste. Further add salt, red chilli powder, dry mango powder and coriander powder. Mix well. Add coriander leaves and mix. Divide the stuffing into six equal proportions. Roll out one portion of the dough into a circle. Place one portion of the stuffing in the centre of the circle. Bring together all the sides in the centre and seal tightly. Again roll out into a circle. Cook on a hot griddle (tava), using a little olive oil, until both sides are golden brown and properly cooked. Repeat with the remaining dough and stuffing to make other parathas. And the delicious Aloo paratha is ready !! 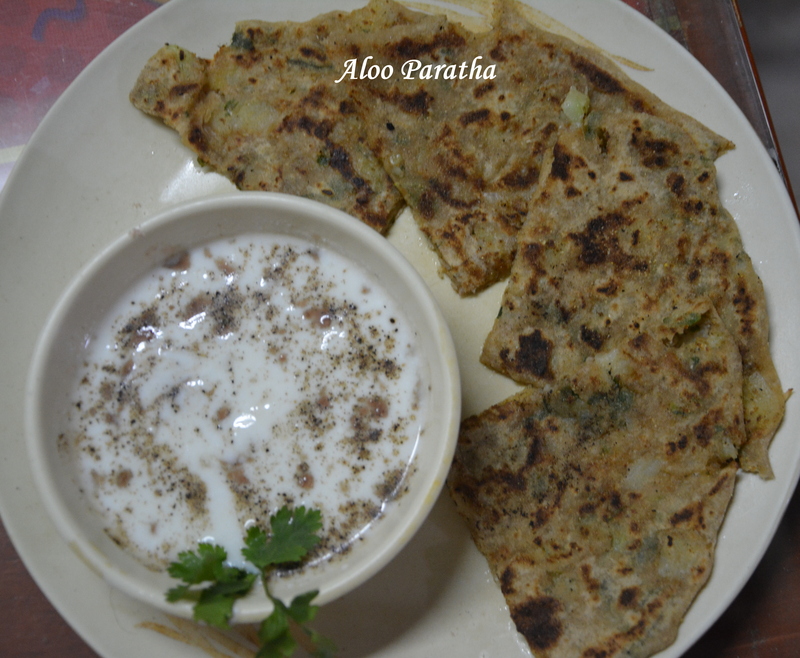 I love Aloo Paratha served with raita !!!! Its just irresistable!! It can also be served with homemade butter or clarified butter (ghee) or pickle or green chutney! !